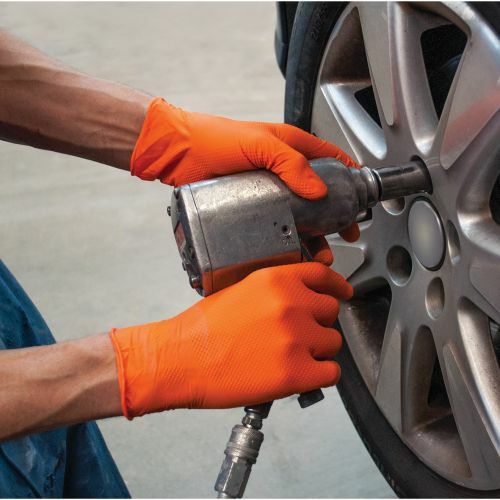 The Polyco Orange HD is a powder free nitrile disposable glove which is compliant to European Standard EN374 providing an effective barrier against oils, acids and other chemicals. The product code for these gloves is GL20. 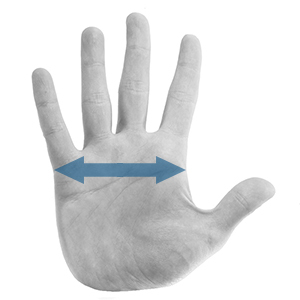 In order to select the correct size of safety glove, simply measure across your palm at the point indicated in the picture. Then compare your measurement with the chart to ensure that you select the correct size glove for your hand. Where your measurement falls on the boundary of two sizes, we would recommend selecting the large of the two sizes for a comfortable fit. However, if you would specifically like your gloves to be a closer fit, perhaps for work that requires fine movements, select the smaller of the two sizes. The Finite Orange HD Disposable Gloves feature a unique diamond grip pattern over the hand area. This optimises the performance and ensures an outstanding grip while you are performing you day to day duties. Made from superior strength nitrile formulation, it provides premium resistance to tears and punctures, yet is extremely soft and flexible. It provides unparalleled comfort and sensitivity. Offering good chemical and mechanical properties for a disposable glove, the Finite Orange HD is highly versatile and has an AQL rating on 1.5. If you have any questions about our range of Safety Gloves available to order online, please don't hesitate to contact the customer service team on 020 7720 2266 for further assistance. Great gloves for working with sheep, strong and long lasting. My company supply basic latex-style gloves. These rip easily and offer little protection. I bought these as i hoped they would be a little better.. I was suprised!!! They were 100% better so much so I bought another 2 boxes.